Yes, I'm training for multiple events. The Hari Keputeraan Run and ABDB Triathlon. So far, my training is not going very well. The only thing I'm ready is the cycling part. It has been 11 days since my last swim and this is due to my eye - conjunctivitis. Right now my eye is still recovering. 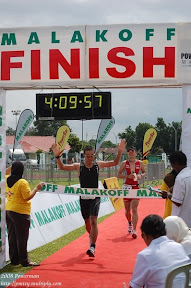 What to do, have to wait until it is fully recovered and hopefully I have enough time to train for the 31st triathlon. For running, I have the endurance, I just don't have the speed yet. For this upcoming event which is this Saturday, the Hari Keputeraan Run - 10Km run, I hope I can do it under 55 mins since a long hill is involve. If it is flat, most probably I will try to target under 52 or 50. There will be a route testing for the ABDB triathlon on Friday 22nd July at Serasa. For me, it will be a test whether I'm ready for it or not especially the swim. If my swim is 'hancur', I will do the team event since 2 of my friends are willing to do it and of course I will be the cyclist.